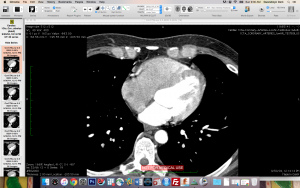 I researched tutorials for how to print a 3D heart model from a CT or MRI scan. 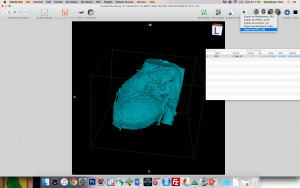 There are currently no tutorials for printing 3D hearts that takes you all the way from the DICOM files to the printer. This was quite a challenge and I still have a lot more work to do. This tutorial is only for an external 3D model of the heart. 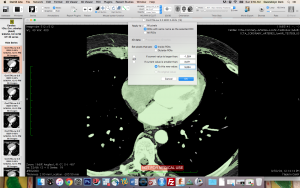 I have not found an easy way to create an accurate 3D model of the internal chambers/structures of the heart. I will continue to research this throughout the semester and repost when I discover a succinct way to accomplish this (any advice is greatly appreciated). 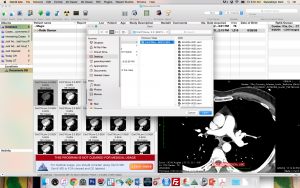 I delved into three different techniques which each utilized a different software. 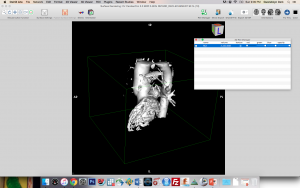 First, I investigated 3D slicer, which is an open sourced NIH sponsored 3D imaging software. Slicer is the equivalent of R in the statistics world, which means there is infinite potential, but it is also not very user friendly. Slicer has plugins that you can download which sound like they outline and make automatic traces of certain body parts. This would be the perfect platform for what I would like to accomplish. Osirix also has plugins you can download, but development would be much slower since it is not open source. 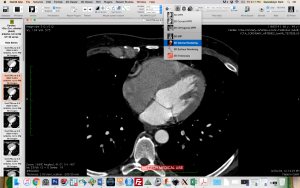 Osirix is also only for Mac, this is a huge limitation of the tutorial. I will eventually discover a nice way to create a model with a PC as well. The second way in which I know people are creating 3D models of the heart is by using Mimics, which is a privately owned software by Materialise ($$$). 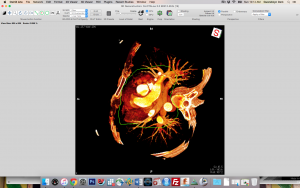 In this software, you make things similar to the ROIs that we will make in Osirix called masks. 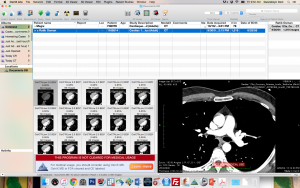 I do not have access to this software so I was not able to play around with it. 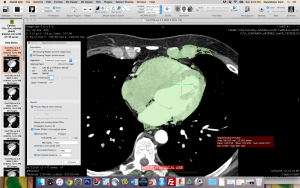 The most widely used software and arguably the most well known to practicing Radiologists is OsiriX. 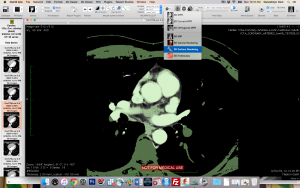 OsiriX has a free version available to the public which you can download here: http://www.osirix-viewer.com/Downloads.html This is the software we will use for my tutorial, again Macs only. 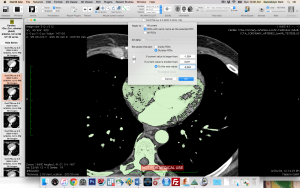 Now without further ado, here is a tutorial of how to convert a CT or MRI scan into a .stl file which can be printed. In my final project, I will look into how to clean up the .stl file in Meshworks to make it amenable to the printing process. I also hope to find a succinct way to accurately print the internal structures of the heart. 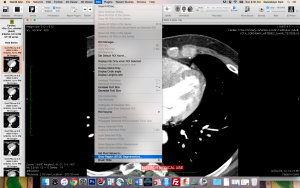 Open OsiriX. A box will pop up if you are using the free version, click agree that you understand this version is not intended for clinical use. 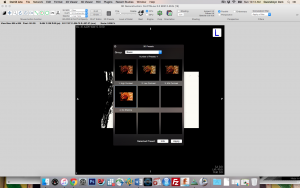 Now exit out of 3D rendering and go back to your 2D image slices. From here select the different views at the top and notice how the cropping has taken out all the unwanted segments. Again go back to the ROI dropdown menu and select “set pixel values to…” This time select ROIs with the same name as the selected ROI and OUTSIDE ROIs. The values should read: if current value is larger than -1024, if current value is smaller than 3071, and to this new value -3024 (black color). Once you have your .stl file you can clean it up in Meshworks. I will continue to work on this tutorial. I appreciate any and all feedback you have for me. I also welcome questions! Thank you! This entry was posted in Reflections by Gwen. Bookmark the permalink. Gwen, your passion for health and the medical field is inspiring. I am fascinated with your take on how you, yourself, can put the Maker Movement to good use and create breakthroughs in your field. I’m very excited to see your 3D printed heart when you are finished!